Lufthansa Technik Intercoat GmbH has recently started automatic coating applying the “Advanced Epoxy Coating” process. Currently, the workpieces have to be rotationally symmetrical. These include, for example, parts of engines or valves – “components from everywhere” as Andreas Sauer, Managing Director of Lufthansa Technik Intercoat, says. For automatic coating, high volume parts are particularly suitable. Even if the quality remains the same, the time span for the coating is significantly reduced. “With the introduction of the new machine, we were able to reduce our throughput time within the coating process to 1/3 in some cases,” explains Sauer. This also shortens the total throughput time for MRO services. The parts that LTI receives come from all over the world to Kaltenkirchen near Hamburg. They are inspected for cracks in an incoming inspection and are subsequently prepared for coating with masking and blasting with corundum or glass. Until the introduction of the new semi-automatic coating, up to three layers of “Interfill“, a material based on epoxy resin developed and exclusively used by LTI, were applied manually. After each working step, the resin hardens in the oven at approx. 120°C. The resin is then applied to the surface of the substrate. Automatic application eliminates two of these three coating steps. For coating, employees clamp the component onto a rotating device. The viscous material is applied in the desired layer thickness via a working arm to which a specially developed nozzle is attached. In general, up to 5 mm high local repairs can be generated with “Interfill”. 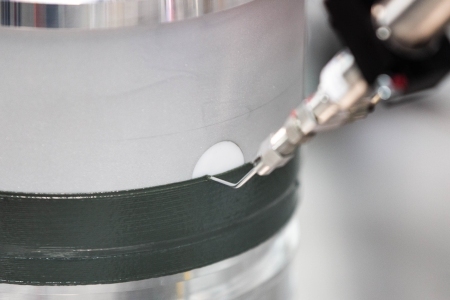 The special application technique with the aid of a low-pulsation piston pump prevents air inclusions and achieves a homogeneous layer application. After application, the workpieces are cured in a furnace. LTI is currently investigating curing via infrared drying in order to save energy and time. In this way, functional surfaces are created according to the customer’s wishes. The coating can have special properties such as optimized sliding properties. Depending on the coating material used, the repaired surfaces are corrosion-resistant after processing, resistant to kerosene and can withstand temperatures between -100°C and 260°C. The coating can also be used as an anti-corrosion coating. For example, worn surfaces, slight damage or cavitation points can be repaired. After curing, the coating can be deburred. The workpiece is then ready for dispatch. Components up to 500 x 500 x 500 mm, weighing up to 25 kg can be coated in the automatic coating cell. A robotic system for more complex repairs is currently under development. After its installation it should be possible to also offer coatings for non-rotationally symmetrical areas.